Off white and red net georgette wedding lehenga saree is enhanced with fanciful embroidered patch border work, lace and stone work beautifies the look. It Included with matching blouse. 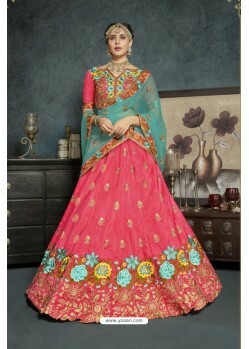 Its a pretty Net/Georgette saree for wear on Ceremonial and Reception. Net/Georgette Fabric and Red/Off White color Zari and Stone used to make this stylish Saree.